When a business is seeking investment it needs to decide what percentage of the business it will offer in return for the investment (think dragons den or shark tank). This simple business valuation calculator allows you to enter the investment and the percentage, and then calculates the before and after investment valuations. There are a number of valuation techniques a business can use, this business valuation calculator uses PE ratios applied as a multiple to projected earnings. By entering details of the projected earnings after tax, the exit year, and high, medium, and low PE ratios, the calculator will calculate high, medium, and low future valuations for the exit year. Finally, based on the original investment, the business valuation calculator will calculate the investors exit value, gain on investment, return on investment (ROI), and the compound annual growth rate (CAGR). An investor will normally look for a CAGR of at least 30%, and this startup valuation calculator allows you to amend the various inputs until this is achieved. 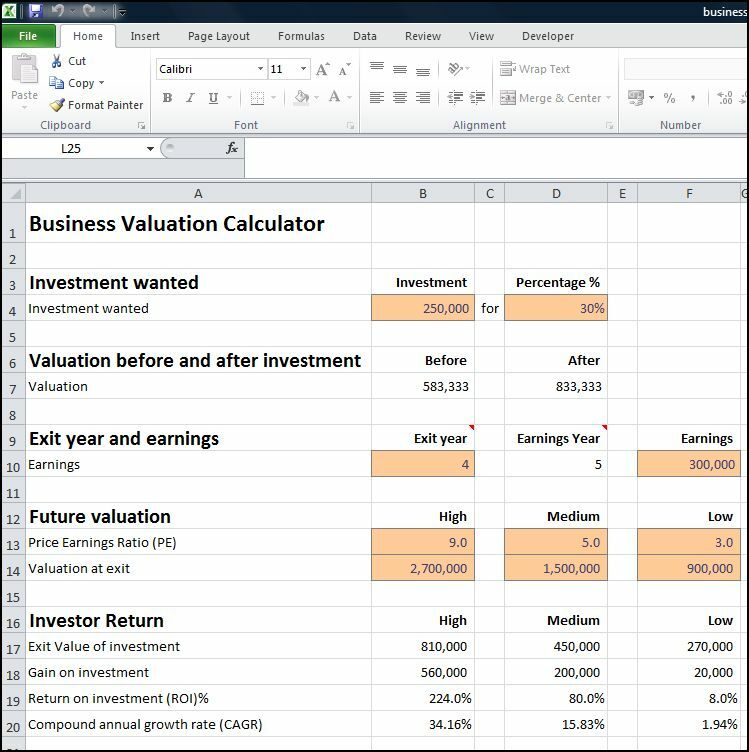 The startup valuation calculator is available for download in Excel format by following the link below. Users use this business value calculator template at their own risk. We make no warranty or representation as to its accuracy and we are covered by the terms of our legal disclaimer, which you are deemed to have read. This is an example of a business valuation analysis template that you might use to calculate the value of a small business. It is a purely illustrative business valuation analysis. This is not intended to reflect general standards or targets for any particular company or sector. If you do spot a mistake in the business valuation formula calculator, please let us know and we will try to fix it.